Well, I don't know about ya'll, but I like my coffee iced. I'm a big fan of Starbuck's, McDonald's Iced Lattes, the iced coffees from 7-11 (a buck .99! and it's GOOD! ), and I'll even make my own the majority of the week when I'm feeling especially broke or don't feel like getting out--on those days I have 2--I'm not picky (just leave off the whip cream, please)! 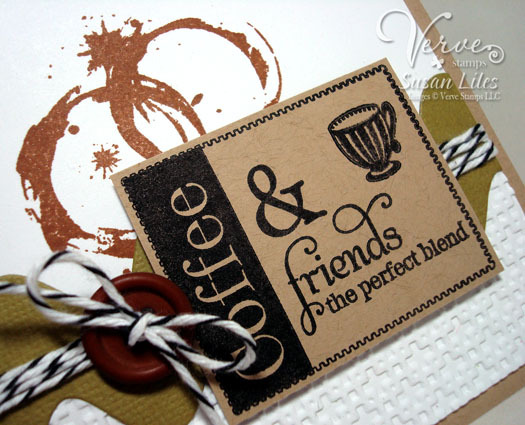 So since coffee and friends ARE the "perfect blend", I thought I'd share this card with ya'll today for our February Diva Inspiration Blog Hop from Verve. 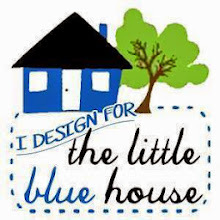 The hop started over on Betty's blog, Stamping to the Wright, and I'm hoping you came here from Sony's blog, Stampin' It Up in LA. If you did, you must have had your coffee already! For my card, I've again combined a little old with a little newness from Verve. I used the Delightful and Delicious set along with the newer, Better With You set for the "coffee rings". Like I said, I love my iced coffee almost any way I can get it. I also love the CAS (Clean and Simple) look to cards. I'm just not a seasoned CAS girl--definitely not my strongest brew--something to work on for 2012 (I actually made another one I like better, so I'm submitting it to a magazine--keep your fingers crossed for me!). If you'd like to try the CAS look too, I have the solution! The last Friday of every month will be a CAS Viva La Verve sketch. HERE'S the one from January that I used for this card. 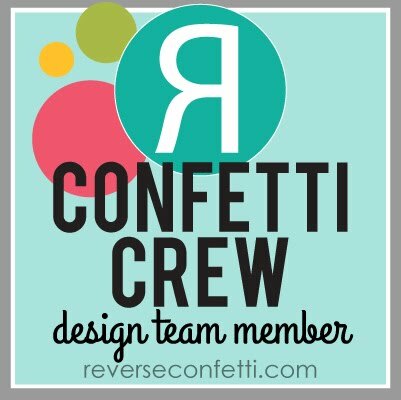 Ok, I'm the last one on the hop today, but if you missed anyone or just want to browse around at some of your favorites again, ya'll can visit the Verve Blog HERE for a full link-listing of designers who've created some extra special eye candy! Thanks for hopping along with us! Time for that second cup...then back to the grind. 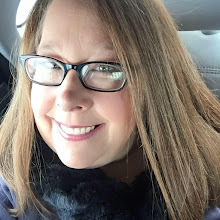 SUSIE Q-TIP: I recently heard a good tip regarding Iced Coffee. If you make it yourself and you have leftover brewed coffee, put it in ice cube trays and freeze it. Then the next time you make your iced coffee, use those cubes and it won't get watered down as that ice melts. Genius. a wonderful creation with an awesome style! Nice card, iced coffee is good too but not with snow on the ground! oh goodness! The Delightful and Delicious stamp set just screams my name! I'm a coffee nut! Love Love Love this card and just went and ohhhhed and ahhhed over the stamp set! I want, I want! Cute card. I'm not a coffee drinker, but love your card. I like everything about this card - it's CAS beauty, the rounded top edges with the brad, and that lovely border die you used! Fabulous card. Loving the layout and colour choices! Thanks for the coffee tip about the ice cubes. I too am a fan of iced coffee, any kind, any size. Love your card reminded me of dark rich coffee. Awesome card! I'm an iced coffee-aholic too! Love the black on the kraft! I am in love with your card!!! I wish I could drink coffee...I love the idea of coffee. ;) Great tip about the cubes. Great card. I like iced coffee, too. The colors here are perfect. And the coffee rings speak volumes, as if you just finished up a cup with a good friend. i love love love this card.. it's fabulous!! Love the "perk"iness of the card. I am more of a tea person but lots of friends who love coffee. But, I love coffee ice cream and stuff like that. How about Dairy Queen's mocha things? Anyway, I love the rich details of the button and the coffee rings as well as the texture that sort of resembles a napkin! I love it a latte and all those good puns! I think this is a wonderful CAS designed card. Those coffee rings are a wonderful addition here! I agree with you. Whipped cream does not belong on hot coffee's. Not sure about cold ones, but it cools my hot drink down, no matter how hot you make it!! This is a fantastic card! 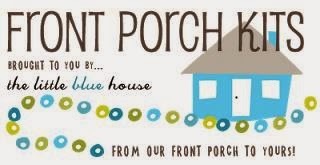 I love that sentiment and have to go check the set out right now!! Thanks! really nice card love the colors. Great card!! I love iced coffee also!! You card does scream ICED COFFEE! Love it! And, great tip with the coffee ice cubes. I'll have to try that. Can't wait to explore your blog more. What a fun card. I like the combination of sets you used!! Great card and so creative! Great card and perfect for my DIL a real coffee gal. thanks for the inspiration. This is definitely magazine eye candy! I love it! And I'll take coffee anyway I can get it...lol! Love reading your blog! I'm a tea drinker and I've been doing the same with my tea by freezing the leftover...best to keep it covered tightly in a ziploc bag so as not to absorb freezer odors. Good luck on your submitted card! This is a really fun card. I'm not a coffee drinker, but I do like this sentiment and I like the details you put into your card. Fabulous CAS coffee card! I like the rings. Great card - love the partially embossed look and that twine. I really like this card. Love that bold rickrack shaped piece in and the coffee cup stains really stand out. Really nice. Fabulous CAS card! Love the coffee rings, and that great sentiment block!! Awesome job!! Love this CAS card...especially anything coffee themed! Great tip about the iced coffee too! This java card is super cute!! I really love the coffee rings stamp, it's so realistic!! I love your work! Susan, you are so talented and creative. TFS!!!! 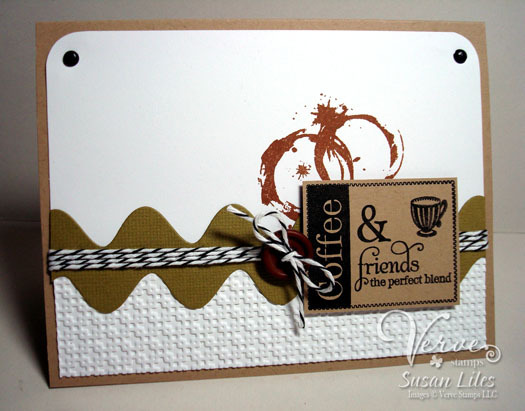 Great card - love those coffee rings! Too funny! I love coffee and I like mine hot! When they came out with this stamp to make it look like there was a coffee ring, I fell in love with it. Great job. I like your card. Cute. I really hope my love for coffee comes back after these babies arrive! I've missed it so. Your card is fabulous, Susan! Love the clean, crisp colors and the ricrac with the baker's twine is a bit of genius. Oh I like this CAS card. Love those coffee stains. That large rickrack panel with the bakers twine looks great. This is just perfect!! Perfect Theme, Perfect Stamp and Sentiment, Perfect colors and details!! Perfect! !